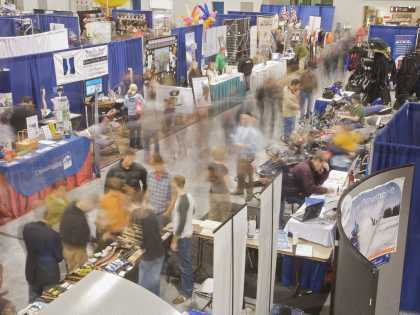 "I&apos;ve Always Wanted to Go There"
Let’s face it: when Alaska is mentioned, most people have it on their “bucket list.” Meeting in Anchorage can boost interest in the event and increase the number of participants; Alaska is a place attendees already want to visit. Give them the chance to make lifetime dreams a reality: flying over and landing on a glacier, riding the runners of a dog sled, golfing under the midnight sun or catching a king salmon. Alaska has about one square mile of land per resident, and when it comes to meeting spaces you’ll find plenty of room as well. 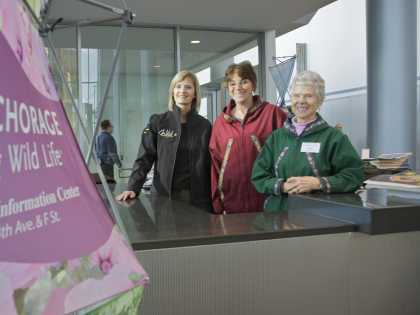 The Dena’ina Civic and Convention Center offers 100,000 square feet of meeting space. 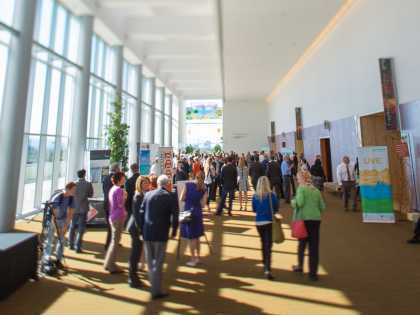 Just two blocks north, the William A. Egan Civic & Convention Center has 33,000 square feet of meeting space in a layout easily tailored to fit small sessions as well as larger gatherings. And that’s just the first taste of Anchorage’s venues. In a city of 300,000 people, your event will get a warm welcome and plenty of attention. Alaskans are known for their friendliness and hospitality. The city’s caterers, event planners and entertainers have what it takes to make your meeting easy, comfortable and memorable. It’s just six miles – mere minutes – from the airport to downtown Anchorage. Hotels and convention centers are centrally located with restaurants, shops and art galleries filling the city’s avenues. Exploring Alaska before and after the meeting is easy, too. 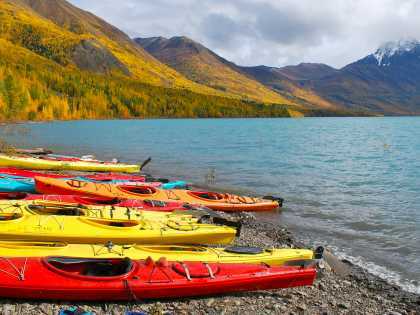 Road, rail and air routes put Alaska’s vast natural wonders within reach. Costs in Anchorage are competitive with those in other destinations. Not only is meeting food and beverage less expensive in Anchorage; there is no sales tax, which is good for your meeting’s bottom line. 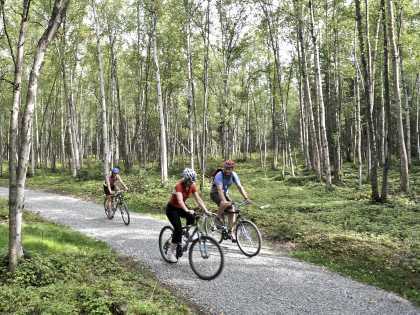 Anchorage has the perfect blend of metropolitan amenities and outdoor adventure. Fantastic meeting sites are coupled with gorgeous views of six mountain ranges. Fine dining and shopping are paired with hundreds of miles of paved multi-use trails and thousands of acres of pristine parkland. There are more than 3,000 modern hotel rooms in downtown Anchorage and thousands more throughout the city. In addition to cozy accommodations for delegates, these properties also offer meeting spaces with unique Alaska ambiance. When the session ends, more unforgettable experiences and adventures await. 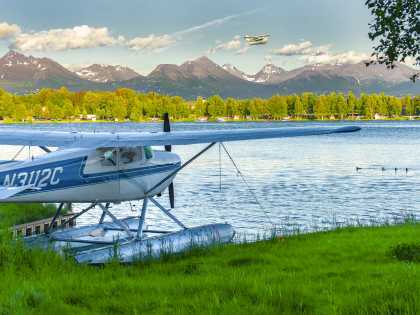 Take to the skies with a flightseeing excursion around Denali, learn the secrets of Alaska cooking together or bring the whole group on an ATV trip through Alaska’s backcountry to spot wildlife. 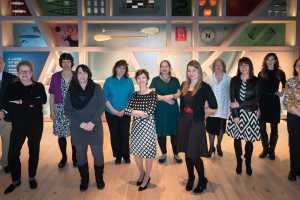 The Convention and Meeting, Sales & Service team at Visit Anchorage knows the industry, is passionate about Alaska and can help make your next meeting easy, successful and fun. It’s a trip attendees will be talking about for the rest of their lives. Getting to Anchorage is a snap. With connections from all over the world and more than 240 flights arriving daily at Ted Stevens Anchorage International Airport, Anchorage is easily accessible. Flights on all the major carriers connect Anchorage with the contiguous 48 states as well as Asia and Europe. There are nonstop flights available from many major U.S. cities.